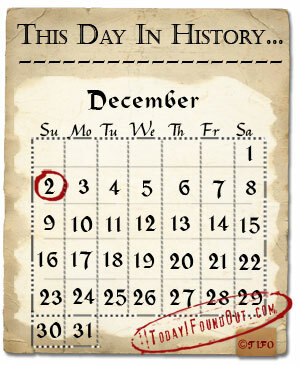 On this day in history, at 3:25 pm CST, 1942, as part of the Manhattan Project, famed physicist and Nobel Prize winner Enrico Fermi, the “father of the atomic bomb”, and his team successfully started the word’s first man-made self-sustaining nuclear chain reaction on a racquetball court under the west stands of Stagg Field stadium at the University of Chicago. 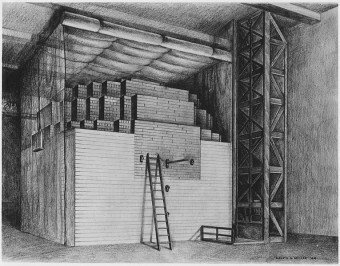 This first nuclear reactor, called the “Chicago Pile-1” had no cooling mechanism to guard against a runaway chain reaction. Fermi felt that the risk of a runaway chain reaction was low given the design. Thus, he was comfortable going forward with the test without a cooling system, even though it was conducted in the heart of Chicago, Illinois. Luckily, Fermi was not wrong and the experiment was a complete success, rather than one of the worst disasters in U.S. history. The Chicago-Pile-1 itself was named such because the reactor was more or less a pile of items stacked on top of one another, primarily made of uranium pellets, separated by graphite blocks, and rods coated with cadmium used to control the reaction. The pile of blocks was held together by wood. The reaction itself was controlled by pulling in or pushing out the rods, which would have the effect of increasing or decreasing the neutron activity due to the fact that the cadmium coated rods absorbed neutrons. So as the rods were withdrawn, the nuclear reaction could increase until the critical point when it would become self sustaining. The first such self sustaining reaction lasted 28 minutes before being shut down. Along with not having a cooling system, the Pile-1 also had no ionizing radiation shielding. Possibly as a result of this, Fermi died at the age of 53 of stomach cancer, just twelve years after constructing the Pile-1. Two graduate students who worked on the Pile-1 also subsequently died of cancer. Since then, numerous awards and other items have been named after Fermi, including the 100th element, Fermium (Fm), on the periodic table of elements. This element was actually first discovered in 1952 when studying debris from the first hydrogen bomb explosion. The sight of the Pile-1 is also now a National Historic Landmark, though the actual plot of land that the experiment was conducted under is now where the University of Chicago’s Regenstein Library building is. One of the graphite blocks used in Pile-1 can be seen at the Chicago Museum of Science and Industry.